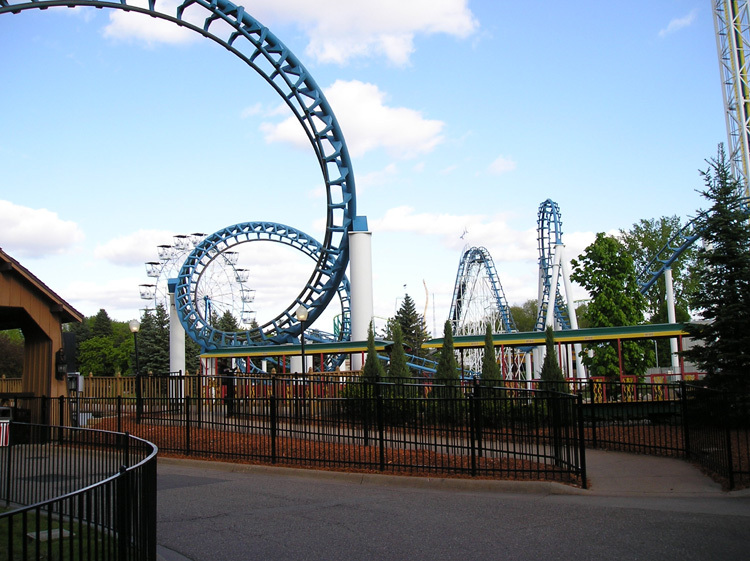 As one of the smaller parks in the Cedar Fair Entertainment chain, Valleyfair in Shakopee, Minnesota still gives guests and enthusiasts that punch they are looking for. The park is still the largest in the upper Midwest of the United States and has always been a park with thrills in mind. The park was originally opened in 1976 as a Coney Island inspired park with roller coasters already built for the opening like the Corkscrew and High Roller. Allison Turner was operating the park until 1978 when the park was interested in increasing the capital of the park and they turned the operation over to Cedar Point located in Sandusky, Ohio. This is where Cedar Fair was born. The managers at Cedar Point decided to create a company out of the two parks and begin a theme park industry. They named the company after its two parks Cedar Point and Valleyfair. Since the acquirement, Cedar Fair has put in over 90 million dollars of investment to the park and added new rides and attractions year after year. There were problems over the years that the park had to deal with as well. The first thing was the fact that the park had been built very close to the flood plain of the Minnesota River. In 1988, 93, and 98 significant flooding occurred in the Spring and would affect rides such as Excalibur and Thunder Canyon. In 2000 the park also had to put a height restriction on rides because of the nearby airport. The park wanted to build their Power Tower to 300 feet, but was required to only build it to 275 feet with the restriction. Today the park is running strong as ever with 48 total rides that include 8 roller coasters. Fans really enjoy coasters like the Arrow steel-woodie known as Excalibur and the GCI woodie called Renegade. Wild One and Steel Venom are two of the more popular steel coasters in the park and can really give every enthusiast the ride of their life. Valleyfair also has a water park located inside the park called Soak City. The water park is included with park admission so make sure you bring your swim suit and prepare to get soaked. Valleyfair also has a great Halloween Event called ValleyScare that is considered to be one of the best in the chain. Next time you are travelling to the upper Midwest, make sure you slot some time to go to Valleyfair where the thrills are always on your side!